If you have any questions about the Chuggaboom information page below please contact us. With launch in 2013, the 54m (177´) motor yacht Chuggaboom is a beautiful expedition-styled displacement vessel, built by the US shipyard Newcastle Marine. With naval architecture by both renowned design studio Vripack as well as Murray & Associates L.L.C., the Chuggaboom superyacht features a sophisticated exterior by Vripack, while her stunning interior is by well known Andrew Winch Designs Ltd.
Newcastle four deck superyacht Chuggaboom offers an open air sundeck, featuring a helipad at the rear. A social as well as relaxing space defined by a popular Spa Pool and sunpads sit to the fore of the sundeck. Jumping all the way down to the main deck, it is easy to see the spacious utility deck forward of the superstructure. That space is decked out with the vessel's tenders and jet ski toys, served by a dedicated crane. Boasting a steel hull and aluminium superstructure, the luxury yacht Chuggaboom reaches a comfortable cruising speed of 12 knots. Her beam is of 11.50m (37´73´´), while her maximum draught is of 3.96m (12´99´´). 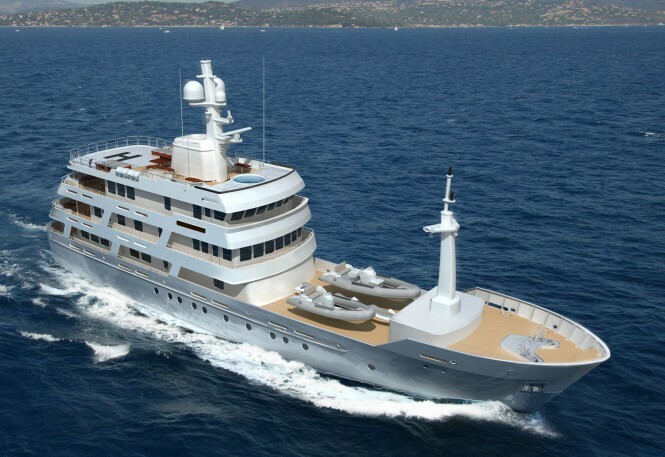 Newcastle four deck luxury yacht Chuggaboom provides an open air sundeck, featuring a helipad at the rear. A social as well as relaxing space defined by a popular Spa Pool and sunpads sit to the fore of the sundeck. Jumping all the way down to the main deck, it is easy to find the large utility deck forward of the superstructure. That space is decked out with the vessel's tenders and jet ski toys, served by a dedicated crane. 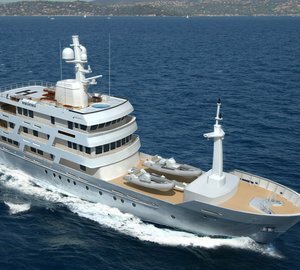 The large utility deck forward of the Newcastle superyacht Chuggaboom provides space for yacht tenders as well as jet ski toys, served by a dedicated crane. The luxury yacht Chuggaboom displayed on this page is merely informational and she is not necessarily available for yacht charter or for sale, nor is she represented or marketed in anyway by CharterWorld. This web page and the superyacht information contained herein is not contractual. All yacht specifications and informations are displayed in good faith but CharterWorld does not warrant or assume any legal liability or responsibility for the current accuracy, completeness, validity, or usefulness of any superyacht information and/or images displayed. All boat information is subject to change without prior notice and may not be current.